Sukin rosehip oil reviews can be found spread all over the internet once you want to find them and they are all very positive relating to this organic oil’s benefits to a number of skin issues like dry skin, eczema, prone to breakouts complexion, scars, sunburns, dullness and fine lines on forehead, eyes or face. Users seem very pleased with the product’s performance and quality, and even those who hadn’t heard about rosehip oil before found it unexpectedly useful and effective for their skin. Those very positive reviews is also what urged me to write a review on Sukin Rosehip Oil since rosehip oil is one of my favorite natural oils, too. So, I wanted to research more about the specific Sukin natural product and find out more about its benefits as well as user reviews. According to Sukin, which is an Australian natural skincare company that creates other well reviewed skin care products, this organic cold pressed rosehip oil is one of their best sellers. Extracted from the seeds of the Chilean rosehips growing in the wild through a solvent free process, it gets packaged retaining its actives for more effectiveness. By containing vital for the skin’s health and beauty nutrients, it can promote a glowing and healthy skin. It also has soothing properties and is great for skin renewal. It absorbs quickly without suffocating the complexion. Essential fatty acids which are necessary to protect cell membranes, keeping the skin healthy, rejuvenated and more resistant to aging. Vitamin E tends to work as a natural sunscreen, protecting complexion from the ultra violet sun rays but is also a strong antioxidant, making skin look healthier and more youthful. Lycopene, which is also known as carotene, is an antioxidant that promotes the connectivity of the skin cells. That way, it can improve your skin’s texture, helping it look and stay younger. It is also able to inhibit the damaging effect of the free radicals and therefore protect your collagen. This can result in a more elastic and firm skin. Beta Carotene is one more member of the “carotenes” family, meaning that it is an antioxidant which can protects skin cells from the free radicals negative effect. There are different ways to use this oil and this depends on which method suits you more. The common procedure is to apply 2-3 drops of it to the palm of your hand and then massage it softly to the desired area which should be properly cleansed before. It is suitable for all part of your skin with a lot of people using it on their neck, forehead, under eyes area, body and even feet. A lot of people mix it with their normal moisturizer and apply it on their skin while others prefer to use it on its own and, depending on the case, use their moisturizer afterwards or not. A key tip is applying it on damp skin since water will help the oil’s active elements get absorbed better and the oil will lock in this additional moisture for longer lasting hydration. What I do is spray my skin with a thermal water spray which is soothing and of course free of all these harmful water additives such as chlorine, leave it on for few seconds as to be slightly absorbed and then apply a few drops of rosehip oil. The sensation you will get is a lot more refreshing and skin invigorating. Lot’s of users also combine this oil with Sukin Facial Moisturiser and are very pleased with the fresh moisturizing effect they get. 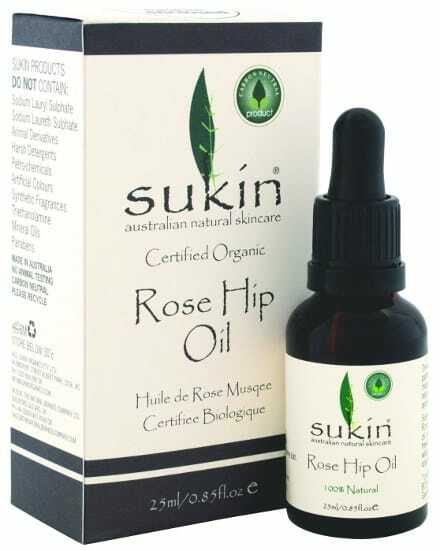 What Do Sukin Organic Rosehip Oil Reviews Say? One thing that always impresses me when I look at reviews of good quality organic rosehip oils is the unanimous positive reviews of users, and what pleases me is the many uses of this natural oil in a lot of problematic skin issues. But let’s see in what different ways Sukin oil has benefitted women’s and men’s skin. Great for all types of skin, including combination and acne prone skin. One of the things that I always read about people’s experience when using natural oils is the impression that they have about natural oils being heavy for their skin or even triggering break outs. I have a combination skin and up to now no natural oil I have used including rosehip oil has ever triggered any blemishes and believe me I have tried out quite a lot. Still, you have to know when and how to use them and find out which natural oil suits your skin’s needs best. Relating to rosehip oil now, users mention that it has actually helped their skin be more balanced and make it look healthier and more glowing. A lot of them have also seen positive results as to the fading of acne scars. Helps dry skin be adequately hydrated. Finding a completely natural way to deal with dry skin can be most of the times tricky and with doubtful results but in the case of sukin rosehip oil people comment how nourishing this oil has been, making their complexion softer, smoother and more supple, eliminating any feeling of tightness. Excellent with fine lines. For a lot of users, this natural oil has worked miracles in fading and even eliminating fine lines on forehead and other parts of the face. Works with dry skin patches appearing in cases of Eczema and Psoriasis. Users dealing with these skin conditions have benefitted a lot by adding this natural oil in their skin care regimen. Since sukin rosehip oil doesn’t contain any fillers or chemicals, this means that it is also not going to irritate sensitive skin. Its healing and soothing properties seem to be helping people with problematic skin issues like Eczema and Psoriasis. Tried out on dark spots, sun spots and pigmentation with positive results. A few users have also mentioned how this natural oil has helped them reduce dark as well as sun spots in a matter of a few weeks. Glowing complexion. As a natural booster full of antioxidants, this oil can actually “feed” your skin with essential nutrients which will give it a nice healthy glow. In conclusion, sukin rosehip oil seems like a great natural way to get a more healthy glowing and nicely moisturized skin away from harmful chemical and synthetic ingredients. Given the fact that sukin rosehip oil reviews that are spread on the internet are in their wide majority overwhelmingly positive as to the multiple uses of this product and its effectiveness, then there is no reason that you wouldn’t want to add it in your skin care regimen like thousands of other organic rosehip oil lovers.